Butsuga soll eine Art Archetyp, nämlich den durch die Welt wandelnden Buddha darstellen, mitfühlend und zugleich losgelöst. Die Aufnahmen entstanden in einem japanischen Garten, in einem Teehaus, in Pavillons. Franklin spielt die traditionellen und improvisatorischen Stücke auf verschieden großen Bambusflöten. Der Name Shakuhachi bedeutet ursprünglich 1.8 shaku (jap. Längenmass) = ca. 33 cm.. Wichtiger als das Längenmaß sind die Blas- und Atemtechniken, am wichtigsten ist der Zen-Geist des Spielers. Und der ist hörbar. Butsuga is the combination of two symbols: those for "Buddha" and "image". The notion that this implies, of an image of Buddha or a Buddhist image, can be understood in various ways. This recording, Butsuga, combines these two images through the way it was created. Recorded on location in a Japanese garden, a place where the harmony of the natural world becomes selfevident, the music was conceived and presented as a journey through the garden both in space and time: recordings made at the significant geographical and symbolic features of the garden, within the changing moods of one day (from dawn to dusk, literally). The style of Japanese garden used for this recording is kaiyushiki, a large area in which one may stroll around, visiting various landscapes and edifices, rich in Japanese landscapes and natural sounds. Beginning and ending with tranquility, the natural sounds of the garden are present throughout. Some pieces were actually conceived in such a way as to deliberately integrate these sounds. Looking for Deer bases its phrase lengths around the ebb and flow of the deerstartler, and Peace Bell revolves around a collage of bell and chime sounds recorded near the Bell House, an edifice near the entry to the Garden. Some pieces, including the shakuhachi parts for Peace Bell, were recorded in a large, resonant pavilion, one of a cluster of buildings representing a city on the shores of the ocean. The journey climaxes with the attainment in the midafternoon of the peak of the symbolic mountain, represented by traditional honkyoku, Yamagoe (Mountain Crossing). The honkyoku represent the original repertoire for shakuhachi, performed by itinerant Zen monks as a form of meditation, themselves on a journey, seeking realization as the image of Buddha. A virtual walk through a Japanese garden, blending human and natural landscapes, and instrumental and natural sound worlds. Composer and Shakuhachi Master (shihan) James Ashley Franklin has developed a musical career bridging a wide range of styles, from classical Western music to electronic music, and to traditional and modern music for the shakuhachi. After studying Western art music together with ethnomusicology at the University of Sydney, and training as a composer, studied composition in Europe. In 1986 he met shakuhachi grand master Riley Lee and discovered a natural affinity between the music he was composing and the music for this ancient flute. He then began studying with Riley Lee and later with world-renowned shakuhachi exponent Katsuya Yokoyama. In 1996, Yokoyama-sensei awarded him the title of shihan, shakuhachi master. James has composed a variety of works featuring shakuhachi, and given numerous performances throughout Australia and Europe. In 1998, he was awarded the degree of Ph.D. from the University of Sydney, for a folio of compositions and theoretical dissertations focusing on shakuhachi in combination with other instruments. 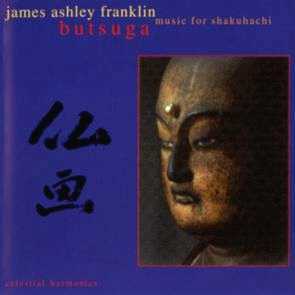 In 1993, James began teaching shakuhachi. In 1994 he was appointed as a founding lecturer who helped establish the Music Department of the School of Contemporary Arts, University of Western Sydney, Nepean. In 1998 he was chosen to assume the role of head of department. 3 Looking For Deer 4'31"
6 Yamagoe (Mountain Crossing) 5'44"
8 Tamuke (Prayer for Safe Passage) 6'34"